May 3, 2018 – Martin’s West – 9:30 a.m. – 3:00 p.m.
manufacturing companies, resource providers and potential talent! 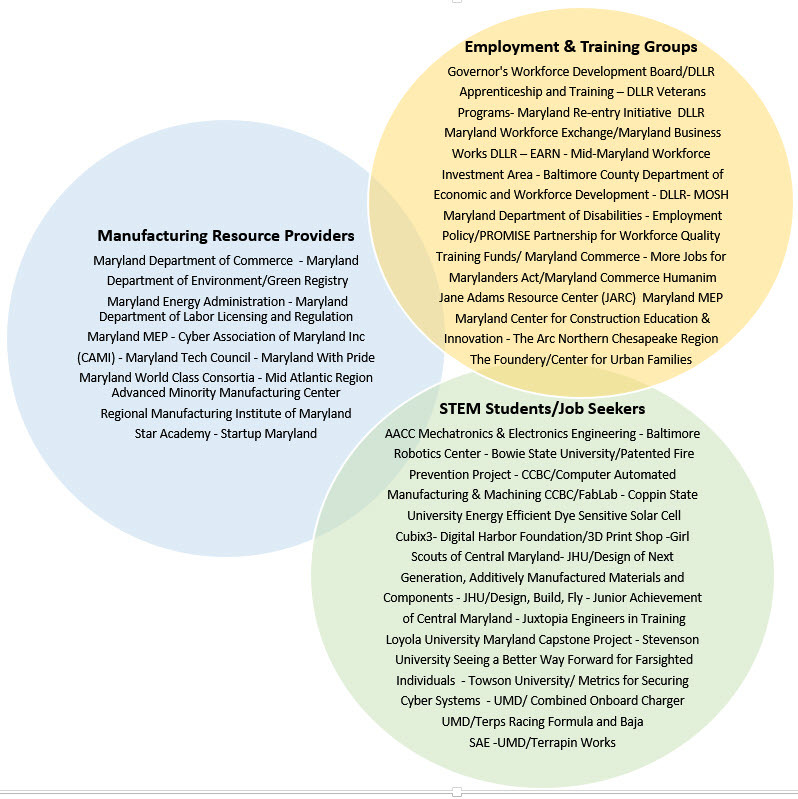 Face-to-Face Meetings with Industry Sector Leaders: Students and those seeking employment opportunities can connect with Maryland manufacturing companies from top industries with current job openings. Get Noticed: Get exposure to key industry leaders by showcasing your technologies, services, and products. Employment Resources: Access DLLR employment resources and matchmaking service onsite. The DLLR onsite service desk can help you find student interns, apprentices and future hires for your business needs. Business Development: Representatives of Maryland Department of commerce will be on hand representing programs that serve manufacturing. Manufacturing HR Directors can meet job seekers and share current job openings with attendees and exhibitors. Manufacturing Exhibitors can choose industry cluster sections in Defense & Aerospace, Food Industry, Health & Life Sciences, Energy & Sustainability, Electronics & 3D Printing and Consumer Products & Packaging (60 exhibits available). University/College STEM Student Clubs interested in exhibiting and seeking high tech jobs with some of the most innovative Maryland manufacturing companies (20 exhibits available). Manufacturing Ecosystem Suppliers interested in showcasing their unique services of interest to the manufacturing industry (20 exhibits available). Manufacturing Executives interested in connecting with other leading manufacturers in Defense & Aerospace, Food Industry, Health & Life Sciences, Energy & Sustainability, Electronics & 3D Printing and Consumer Products & Packaging. Manufacturing Human Resource Directors interested in hiring some of the brightest students coming out of Maryland’s colleges and universities. Individuals Seeking Manufacturing Employment will be able to review current job openings and meet with potential Maryland manufacturing employees. High School STEM Students onsite who are interested in meeting with university/college STEM students and manufacturers, especially those seeking youth apprenticeship opportunities with manufacturers.